Kiedan Hartley with general manager Davide Longo after signing for Featherstone Rovers from Leeds Rhinos. ENGLAND Academy youngster Kiedan Hartley has joined Featherstone Rovers from Super League side Leeds Rhinos. The 18-year old captained the Rhinos at scholarship level and has signed a one-year deal at the LD Nutrition Stadium for 2019. He said: “As soon as I knew Featherstone were interested in me, I definitely wanted to snap it up. “You look at people like Jack Walker, who stepped up at such a young age and just adapted to that physicality of playing against grown men. The East Leeds product operates at full-back, but has also shown his versatility across the outside back positions while under Rob Burrow at the Rhinos academy. 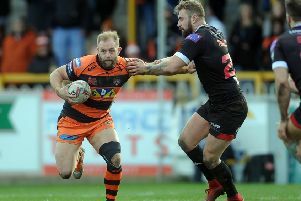 Hartley will link up with another of Featherstone’s 2019 signings, Dakota Whylie, who has also come from the Rhinos academy. He added: “I’ve spoken to Dakota a lot. He’s a good mate of mine and he said it’s a great club. “Watching him and Harry (Newman) play really well, which they have been, is a real incentive to come and perform here myself. “Every time you see the Featherstone scoreline the team has plenty of points. “It shows they’re an attacking team, which is what I’m all about. “I love getting the ball in my hands and just going at defenders. In addition to Whylie, the recruitment of Hartley follows the signings of Papua New Guinea Internationals Watson Boas and Ase Boas, as well as local youngster Morgan Punchard. Rovers general manager Davide Longo said: “Kiedan is exactly the kind of player we are looking for at Featherstone Rovers. “He’s young, hungry and of course, has an abundance of ability. “He also provides versatility across the back line, which would make him an asset to any team.